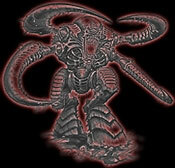 You should look up pictures of the model in the Tyranid Codex as well as keep the box the model came in close by. The picture on the cover of the box and the pictures in the Codex will help guide you as to the intended posture and appearance, which can be very helpful, even if you want to convert the model. I snip the large round piece off the bottom of the left foot and file it flat. The small round needle file from the Testor's Model Masters set is great for the knobby bumps on the back of the tail and torso. 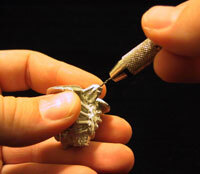 A double ball sculpting stylus. Florist wire and Helping Hands. Remove all flash and scrub the parts clean with dish soap and water. Note: You can substitute epoxy resin putty or your favorite adhesive for "glue" as you see fit. 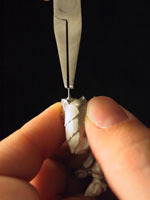 Snip the large round piece off the bottom of the left foot and file it flat. (you might want to keep this piece for some reason, so think about whether or not you want to do this). I did this because I wanted to have the left foot back on its tip one Tyrant and on the other I wanted to pin it to the pieces of a Space Wolf Marine, so I needed to get rid of it in both cases. It is a very sturdy "pin" if you want to keep the left foot flat and take advantage of it; in that case, leave it on. In my first attempts at gluing pieces together, I tried cyanoacrylate glue and found it to be less than desirable. 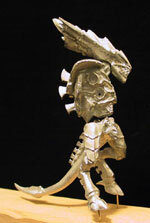 When I moved on to joining the torso and pelvis, I decided to use pins and I liked it a lot. So, I decided to break apart the leg and pelvis pieces and start over, using pins and putty in lieu of cyanoacrylate glue for structural integrity. The fact that I could break them apart should give you some idea as to why I wanted to use pins and putty. Snip the large round piece off the bottom of the left foot and file it flat. (you might want to keep this piece for some reason, so think about whether or not you want to do this). 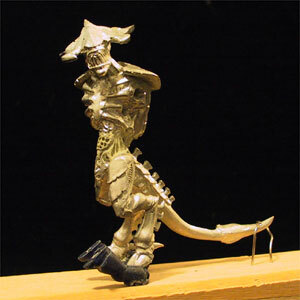 I did this because I wanted to have the left foot back on its tip one Tyrant and on the other I wanted to pin it to the pieces of a Space Wolf Marine, so I needed to get rid of it in both cases. 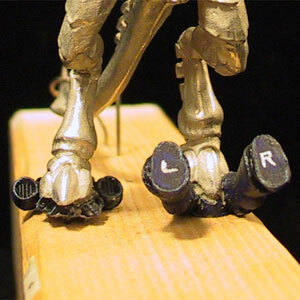 It is a very sturdy "pin" if you want to keep the left foot flat and take advantage of it; in that case, leave it on..
Use pinning, and only pinning (we'll use adhesive later), to join the legs to the pelvis, and the feet to the base. 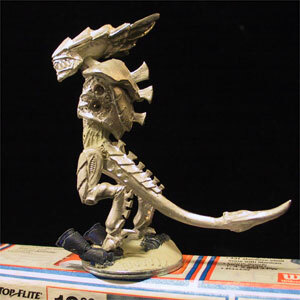 Once all of the pieces are well-matched and ready for gluing, use 5-minute epoxy to join them. If you are careful, you can accomplish good gap filling on the joints by slecting the right amount of epoxy. You have 5 minutes working time, so err on the side of too little, press them together, and add more as needed. Note: you don't need to accomplish gap filling right now. You can always come back later with some putty and fill them in later. Before moving on, I would let the legs and tail joints cure overnight. Because the torso is so heavy and it is leaning forward such that it's center of mass is not over the pelvis, I has to use pinning again. 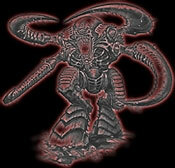 I did this for the head to torso joint as well. To join the pieces I used 5-minute epoxy and then filled the gaps with Milliput putty. Prepare about a 0.5" diameter ball of Milliput Yellow/Gray Epoxy Resin Putty. Check position of head and pins. Determine the exact position you will eventually want and be sure the pin is properly positioned to produce it. 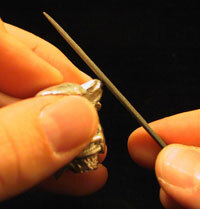 Use 5-minute epoxy to glue the pin into the head. Place ball of putty over pin so that it pokes through. Superglue pin into top of torso. Press head into desired position. 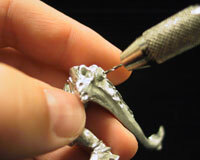 Clean away excess putty and smooth remainder into gaps around joint with a ball stylus. 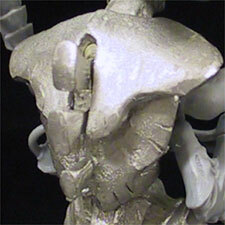 Wait five minutes for the putty on the torso-head joint to partially cure. Check position of torso and pelvis pins. Determine the exact position you will eventually want and be sure the pin is properly positioned to produce it. 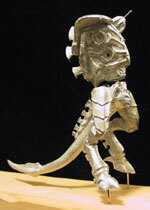 I arranged for about a 1/8th inch gap between the torso and pelvis and then angled it a bit to have a twisting, arching, predatorial position. 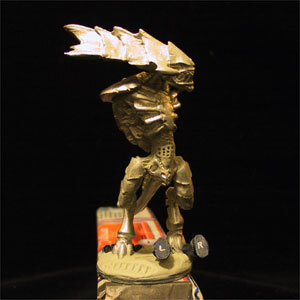 Use 5-minute epoxy to glue the pin into the bottom of the torso. 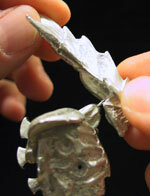 Use 5-minute epoxy to glue the pin into the top of the pelvis. 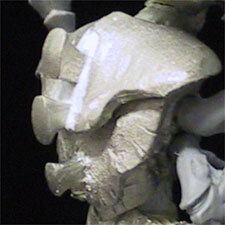 Fill gap with putty and sculpt a midsection. I chose to make honeycomb-like region for the abdomen and then extend the muscle/skin features I created for the leg-pelvis joints into the pelvis-torso joints. 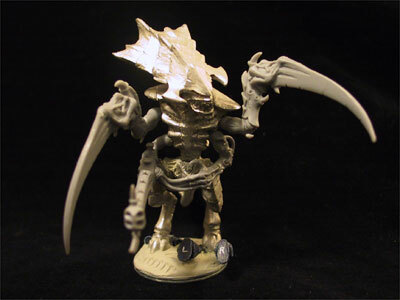 There are many reasons for modelling a solid base. The chief ones are to lower the center of mass of the mini, and thus reduce tipping, and provide a customized aesthetic base. I simply pinned the mini to a thick fender washer and worked the putty into the base. I wet the surface of the base with water and then rolled a Space Marine bike tire over it to create the tire tracks you see. This part is pretty easy, just pick the arms you like, drill holes, and glue them to the pins. My advice is to decide on the positions of all of the limbs before gluing any of them, especially if you have a gun. That gun eats up a lot of space and gets in the way. I used Kneadatite Blue-White putty to fill the unsightly gaps in the back.